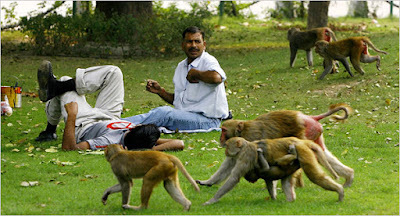 New Delhi, India has a serious monkey problem. Rhesus macaques have taken over the city. And no, I'm not joking. I'm not even exaggerating. A gang of monkeys recently raided the city’s police headquarters. Mean-spirited macaques wait outside of hospitals and attack patients for their IV fluids. Others can be spotted bathing their infants in New Delhi’s fountains or even taking rides on the subway. And then, just when the citizens of one of the largest cities on Earth thought the problem couldn't get any worse . . . their deputy mayor was murdered by monkeys. In October, four of the beasts attacked Sawinder Singh Bajwa while he sat reading the paper on his balcony. As he tried to drive them away, he lost his balance and fell over the side. Yet despite everything, monkeys are still free to frolic through the palaces and parks. Most of New Delhi’s residents are Hindus, and their religion prevents them from harming the animals. 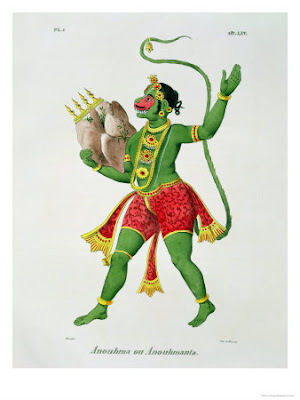 In fact twice a week, followers of the monkey god, Hanuman, still gather to feed the creatures. Until the monkey problem can be solved, officials offer one piece of advice to the people of New Delhi. If you don't want to be attacked, "never look a monkey in the eye." I don't know why I even get surprised any more. I do love hearing about these things,though. I think u r the only person in the world now who could ever use the element of surprise on me,Ananka. sweet, dude thats so crazy it's awesome, but of course :) it's all about the monkeys! Isn't this amazing? I remembered to actually sign in! Those New Delhians (what do you call them?) seriously need to do something about the monkeys! That was on vacation to the beach. Gosh, a couple weeks ago we where watching The Birds! Now it's The Monkeys! We read about that at school a week or so ago. I heard they pay the apes that drive away the rhesus monkeys in bananas. But not that the people of New Delhi are gathering to feed the monkeys.